The Drill Down: AVnu Certification, Does It Really Matter? Networked digital media is the tech trend du jour, but interoperability is the missing puzzle piece when interconnecting systems comprised of equipment from several manufacturers—or even from the same manufacturer. It provides a common language or framework of basic commands and operations that are understood by all devices, and this commonality is what allows even complex systems to be set up and configured with ease. No matter the application or industry, devices have to interoperate in an open way with many other devices, vendors, and manufacturers. That is why standards matter. “Certification of any standards-based technology is important for three reasons. First, it ensures that what is being produced adheres to the standards the certification is built on. Second, it ensures that equipment will work together. And third, certification means multiple vendors are in the market, which positively impacts the price to the end user,” says Gary Stuebing, AVnu Alliance President. AVB/TSN (Audio Video Bridging/Time Sensitive Networking) is an open standard allowing any vendor to support it, but an open standard alone doesn’t guarantee interoperability. Independent certification is key to ensuring interoperability between devices and a no-compromise AV network that is easier and less expensive to implement. "Independent third-party verification brings AV to the next level of technology. Often times we find that we're discovering whether our devices and control systems talk to each other through trial and error,” says Josh Srago, manager of audio visual engineering, ICS. “The manufacturers certainly put in some due diligence to provide as many resources as possible for integrators, but it's time consuming and costly for them to test each and every operation or combination thereof. With independent third party verification and testing, we have an outside body that has no stake in the fight for profit, but exists solely to ensure that the products will all live up to the standards set forth and achieve the interoperable status." AVnu Certification is the first and only open, third party, independent compliance and interoperability certification for media networking in the AV industry. Through this third party testing, AVnu Certification guarantees that all certified products conform to the IEEE open standards for low-latency, time-synchronized, and deterministic delivery of data, and can operate with other manufacturers’ certified products in a mixed ecosystem. “The affirmation behind any technology standard lies in the success of its certification program. AVnu Alliance and its member companies have shown a clear commitment to AVB/TSN as the technology that will bring a better future for the Pro A/V market. The Alliance has developed a robust set of conformance tests that ensure each device implements the required standards consistently in order to achieve product certification,” says Joe Leong, Compliance and Interoperability Chairman for AVnu Alliance. AVnu Certification also gives manufacturers a competitive advantage. Certified products build consumer confidence and eliminate guess work for specifiers. If you see the AVnu certified logo on two devices, you know they’ve been tested and proven to work together. This means that manufacturers can help integrators and designers save time choosing the proper devices as well as configuring and managing those devices on the network. AVnu Certification: How does it work? 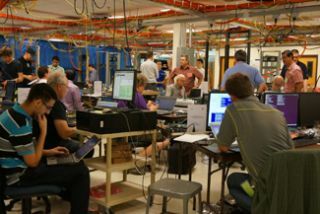 AVnu Alliance members benefit from participating in pre-certification member-only plug fests that offer a unique hands-on opportunity for engineers to test connectivity and interoperability. Plugfests are useful for cross-pollinating best practices between developers from different companies and bootstrapping test plans when common implementation mistakes are seen. Plugfests can also help members spot product issues early on in the process, analyze device behavior and make changes to improve interoperability before entering certification testing. AVnu Alliance chose to do more than simply connect products together and check that they can connect and stream. Instead, they developed a robust set of conformance tests that ensure devices implement the standards consistently. The Alliance defined a procedure that may then be used to certify products to the base IEEE standards. Before certification can be achieved, AVnu Alliance defines the market specific requirements and develops the conformance and interoperability test plans as well as the testing procedures. The test house produces detailed reports and data that is fed back to the manufacturers to help address any issues they may have. Once deficiencies have been satisfactorily resolved and the product has passed the testing procedures, the test report and certification application can be submitted to AVnu Alliance for formal approval and permission to use the AVnu-certified logo. “We are currently pursuing AVnu Certification for our Tesira product line because we want to ensure that our customers have the best possible experience when building networked solutions with our products. We believe third-party interoperability certification will drive industry momentum for AVB/TSN as an enduring, ubiquitous networking standard that our customers can easily use and IT departments will embrace,” said Graeme Harrison, VP of Marketing, Biamp Systems. AVnu Certification means that end users have more choice with best-of-breed products from different manufacturers without worrying if the selected products will work together or not. Interoperability ultimately accelerates a broader ecosystem of devices, which is the long-term advantage of AVnu’s certification program.